Fused art glass decorates this beautiful, frosted glass plaque and you can keep the shards of your broken wedding glass in the attached tube. Easy to fill yourself. 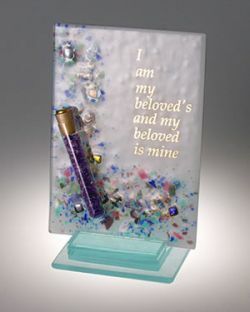 This contemporary design is a composed of layered glass with dichroic highlights and gold lettering in English "I am my beloved's and my beloved is mine". Allow 3-5 days for shipping. (Tube is shown filled for display purposes only - does not include broken glass.) Glass to be broken during ceremony may be purchased separately. See item: Grooms wedding glass.